While my lieutenant had no choice where to move for the first week, now actually I had two options: Move to Misty Plains towards Dawnsmoor, or to Smokeblue Hills towards either Riverwatch or Vynelvale. I actually mulled over this decision quite a while. Dawnsmoor could be reached in week 3, Riverwatch in week 4, and Vynelvale in week 5. The heroes will buy the Staff of the Wild this week, which grants them two moves on the overland map per week. This means both Dawnsmoor and Riverwatch are in striking distance of one week from Tamalir for them. 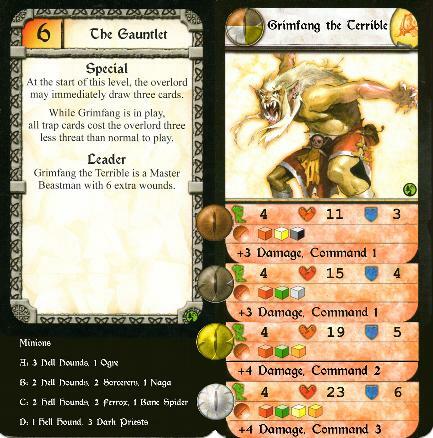 Vynelvale on the other hand has an extra point of defense, and grants no extra conquest when razed. All cities have interesting skills to buy as well. Beseiging a city takes a lot of time, enough for the heroes to equip themselves via treasures in dungeons, return to Tamalir, and attack Alric before I will be able to raze the city. By that time, it will probably be the end of copper level, where they have good chances of beating him...so what to do? I decided to move Alric to the Misty Plains. I think I know what to do with him, but you will have to wait and see what that will be. I also bought the Soul Ward avatar upgrade, as I was more or less forced to because of The Twins. 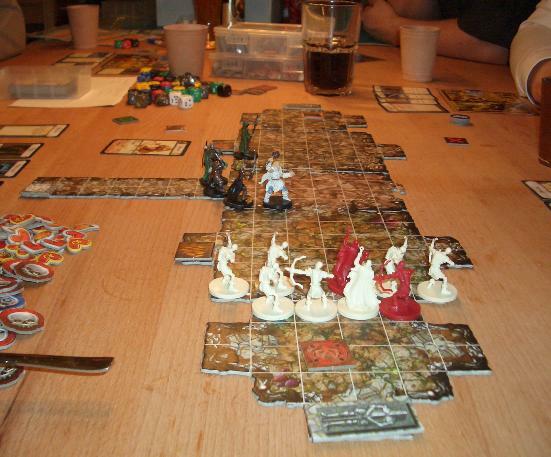 The players decided to move to the Thelsvan Highway and enter the dungeon. We drew...Bag of Bones (17). I had no monster types to choose from on this level; only skeletons were available. Bag of Bones is a very odd level. The level boss is quite powerful with his high pierce, but he only gets very few minions: 6 skeletons (for me, 7 skeletons plus one master skeleton, thanks to Hordes of Things and Brillian Commander). To make matters worse, the dungeon is essentially one large room, making it almost impossible for the Overlord to spawn reinforcements. I anticipated an easy dungeon for the heroes, and as it turned out, it was. Most heroes oriented themselves towards the monsters, only Vrooooom the runner moved north, to get to the chest and the sarcophagus, as I had placed no monsters there. Seeing that this was the first level, I guess they figured chances were that I didn't have many dangerous cards on my hand. They were partially right, but what I did have was a blood apes spawn card...and since they already had covered nearly the whole dungeon with line of sight already, I had to act and try to play my one free spawn on this level now. Too bad that blood apes are large, so I was able to spawn only one on Vjajojajo's side of the dungeon and the other one behind my skellies. Or did I? Wait a moment... 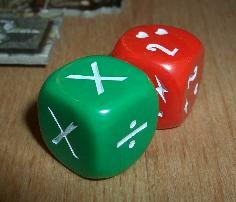 The green die...had two X? No, three actually...uh, what is going on here exactly?!? As it turned out, the player of Vrajitoru owns a mis-produced green die with three X on it, and had innocently given it to me when I attacked him. I guess that was his revenge for me mutilating his hero's name so often. Fair enough, I guess. Of course I rerolled the attack with a correct green die. Uh, guess what happened? The real die rolled an X, too. Yay me! I found all this very funny at that time and laughed with the hero players. However, in hindsight I realize what had really happened: By doing this, Vrajivoodoo had cursed me...cursed me with the terrible X plague! What followed was the most abysmal luck I ever had in any session of playing a luck-based game. Every dungeon level boss I had in this session (four!) turned out to be rendered completely useless, because their attacks would miss or roll minimum damage. Nearly every single time. In addition, I had a terrible draw of cards, getting all important power cards only on the third level, and important level boss enhancers like rage too late as well. And it got even worse, but I'm getting ahead of myself...I only say that a heavy dose of schadenfreude awaits you. So after the failed attack by the blood ape, I moved and attacked with my skeletons. Guess which one missed? The heroes advanced and killed most of the minions, and of course quickly figured out how to deal with King Janius correctly: They nearly killed him on their turn and had one of them place a guard order. When it was my turn again, they used that guard order to finish him off immediately, thus preventing him from coming back from the grave until the start of my next turn, eliminating the bonus pierce for the rest of the skeletons. So as expected, the monsters on this level proved no real danger to them. Vrotuvoodoo opened the chest, but fortunately for me they only found an axe they didn't really need and later sold. On his way back, a nice opportunity for the evil side arose: A classic situation for a deadly pit trap. I played a spiked pit on the last tile he entered, he fell in and had no movement points to get out of it. The pit limited his line of sight to one tile, so he didn't see the beastman war party coming that killed him for 4 CTs... Well worth the 15 threat I had to spend for the spawn counter! Vrodluvoodoo hadn't searched the northern Sarcophagus in order not to waste too much time. The southern sarcophagus got searched however, as they had to dump King Janius in there anyway, and actually had the luck of rolling a chest as the result! They only found gold and potions in the chest. They then tried to leave that level as quickly as possible, and to slow them down a little bit I played paralyzing gas on Thorgrim when he opened the rune door. That gave me an extra turn to act with the beastman war party that was still there and King Janius - which accomplished nothing. The king missed again (of course), and the beastmen failed to penetrate Thorgrim's insane amount of armor (6 with his defender ability!). In the meantime, the revived Vjatrovoodoo went to the (now enhanced) market, and drew Gauntlets of Power, Falcon's Claw, and Heavy Leather Armor. They immediately bought the armor and the gauntlets of course, the latter being essential for alot of broken combos in this game. For now, Kenor received them. And thus ended this level, in the anticipated way: Quickly and with little to no risk for the heroes. 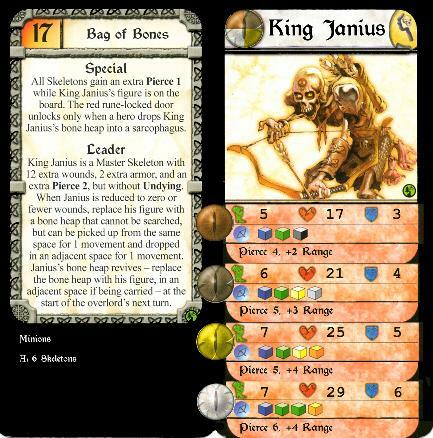 After going through the portal in Bag of Bones, the heroes emerged in The Gauntlet (6). I had accumulated a huge amount of threat, and now that the party was divided, I paid for the spawn counter and 2 sorcerers, then next turn another 19 threat to flip the spawn counter again and spawned another beastman war party on the monster's side. Then the level boss opened the door to attack! However, stupid me had completely forgotten about the guard order Throgrim had placed, and I had accidentally placed the master beastman at the door and the two normal ones behind him and not vice versa, as I should have done. So when I opened the door, Thorgrim's guard order resulted in a dead master beastman and one lost point of command. Stupid Overlord! That I then moved and attacked with the normal beastmen, forgetting to shoot with the sorcerers and the naga first, didn't really help either. That's one disadvantage of the sniper upgrade: You tend to forget that other ranged monsters can not shoot through obstacles . What I also didn't think about, or better didn't know at that time, is that being grappled does not mean you cannot move - it means you cannot spend movement points! A small, but critical difference: It meant that after surviving a power-potioned attack by Rin with 1(!) wound left, the level boss was unable to close the door again! I don't have to mention I lost him next turn, after he was unable to do any harm on my turn. Whether he missed, or simply failed to get through Thorgrim's sick, er...I mean thick armor I don't remember. Let's just say this hadn't been one of my best turns, probably costing me 4 CTs and the level boss. But as one recent review at BoardGameGeek noted, "I also want to point out that I don't care how smart you [the Overlord] are, matching wits with 4 other players of similar skill is going to be hard. They will catch mistakes that you won't." The cards I've been drawing so far were not in my favour either. Kobold swarms, the second hordes of things, two gust of winds, bane spiders...no evil genius or trap master, and so I still had no power card on the table. On the bright side, one of the next cards I drew was...dark charm! After the last two had fizzled, this time it had to work, right? According to the well-known proverb "Three Time's the Dark Charm", I confidently paid the 11 threat, and chose the hero with the highest damage output to bring my wrath on his friends: Vrollblank. You already know what happened, don't you? Yeah, I knew you would. Let's just say I seriously consider swapping out this damn card once I have some treachery available. I had another opportunity next turn to attack Vblankmaster with the naga, a beastman and a skeleton. It's your turn again to guess what the naga did...V-Man survived, but at least had to use the Crystal of Tival to heal. Ah well, by then I was getting used to this and had accepted that this just wasn't my day. At least the chest on this level had no treasure again, and the heroes proceeded in record time to the last level of this dungeon. The next piece of that evening's bad-luck-puzzle was the dungeon level I drew: Puppet Master (31), again with two level bosses for double CTs on the last level. As if the heroes weren't leading in CTs enough already, for crying out loud! Again I chose the naga option, as a master naga has both command and (in theory) a powerful attack. (Lesson for the reader: Try to think of an explanation why I used "in theory" in the last sentence!) 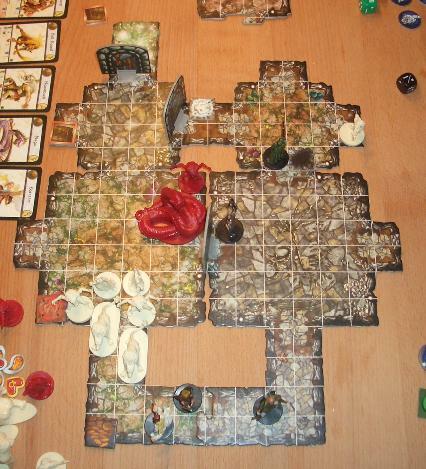 The heroes advanced, and the giant began his slooow move towards the corridor (move 3 only!). On the second turn the giant was unable to attack the heroes since they were too far away (and I hadn't drawn charge yet), but I did not dare to block the corridor with him, as the heroes would have easily slaughtered him next turn. So instead, I moved him only one tile away from the entrance of the corridor, and put three beastmen in front to protect him. Well, that didn't work out that well. I had underestimated the heroes damage and range capabilities, and they easily disposed of the beastman and now had an opening where they could get into the room next turn! The giant was already wounded, because Vrangemnstr had made a battle action against him before Throgrim moved in to grapple him. Vrangemnstr is the southmost figure, 6 spaces away from the giant who had an armor rating of 7 - and yet, Vrangemnstr managed to deal 7 damage to him! Just a reminder: Yes, this is still copper, but having command 2 is insanely powerful, and one reason I don't like Kevin Wilson's rules to create custom heroes - but more on that later. One important rule for the Overlord player is not to waste rage and similar cards on normal monsters, and instead save them for the level boss who is considerably stronger usually. This was the end-fight of the third dungeon level, so by now I should have my rage ready to play on the giant now, right? ...RIGHT? Heh, of course not. No idea where the rage was - still buried in the deck somewhere. So I had only a normal attack with the giant, but that should still be very impressive, with five dice, reach, stun, and sweep! It was a great feeling to use so many dice for a change...only that I missed. AGAIN. In fine level-boss tradition, I rolled an X for the giant's attack. Can you recognize a pattern here? 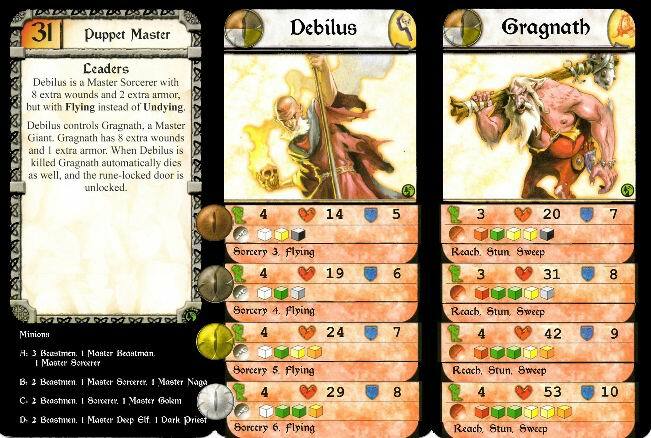 The heroes moved into the room to attack the master sorcerer instead of the giant, as the giant would die as soon as the master sorcerer would be dead. They made two attacks, both enhanced with power potions. No problem I thought, at least I had 2 dodges in my hand! Well, that didn't help much, as the reroll of the second attack proved to be as good as the first one, and my two boss monsters were no more. The hero players rightly pointed out that it had been a mistake not to block the corridor with the giant earlier, and I agree. However, all I missed out on was one turn to attack with the master sorcerer which wouldn't have been enough to kill anyone, so all the heroes gained by my mistake were probably two healing potions. But there was still the master naga left! As mentioned previously, master nagas have an impressive attack, and finally I had drawn rage! Maybe I could get some solace from killing a hero with the enraged naga. Only thing is - you guessed it - she missed one of her two attacks. Can you imagine I was about to bite in the table out of frustration at that point? Rin and (I think) Kenor were still on the level, and they tried to protect the monkey on its way to the glyph via guard orders. While the monkey was slowly limping to the exit, I drew a ferrox and a razorwing spawn - nice but ueless, as they would die easily by the heroes' guard orders when I'd have to advance on them. But on the last turn, while all three stood around the glyph, I drew a skeleton patrol! That was great insofar as they were three monsters and not only two, and that only Rin could activate his guard order (Kenor had no ranged weapon). I spawned them, and moved into position. Rin activated his guard, attacked...and missed. No big deal though, as he has the deadeye ability and can reroll in case of a miss. And...he missed again! Hope, at last! Can you believe this? For once, the heroes had bad luck, and now I had two normal skeletons and a master skeleton to shoot at the helpless monkey! That might be enough to kill him, and get me my second kill! Can you say "miss"? Yeah, I knew you could. Boy, this gets old fast! The heroes left the dungeon, I was left bruised, battered and utterly defeated, and that was that. So that you get an idea of just how complete my defeat was: The heroes had successfully completed three dungeon levels, and I hadn't eben cycled through my deck once. Good play and some luck on their part, and terrible luck and two mistakes on my part lead to 24 CTs for the heroes and 4 for the overlord. But now I think that more than just bad luck and some mistakes are at work here. Even if I added the CTs lost by bad luck and my mistaked to my total, I would still be behind the heroes - which, by all accounts and experience from others, just shouldn't be the case. Instead, I should be leading the CT total by a factor of 1.5 or even 2. So what is the problem? The problem is the ruleset for custom-made heroes. I suspected as much from the beginning and tried to persuade my players not to use them, but now I'm confident that this ruleset is broken. If used properly by the hero players, it can shift the balance of the game severely to their side. Warning: What follows is a rant and some number-crunching about hero armor. If you don't want to read it and just like to follow the story of our campaign, skip the next section and read on here. Kevin Wilson's "Create Your Own Heroes" rules is broken. Why? Because they include too many abilities that will affect (nearly) the whole party. Most premade heroes from the original game have abilities that are oftentimes better that those available in the custom ruleset - but which will only affect the individual hero. However, with the custom ruleset the player can cherry-pick those abilities that boost not only him, but the whole party of four. That's four times the power of the ability from the original set, and since the players can choose exactly what they want, they can create a synergetic party that works together perfectly. Another problem is the Tactician ability. It's very strong on its own, and I cannot imagine why a party shouldn't include a character with this ability. Again, an effect for all heroes! But that's not the only problem - to make matters worse, it exactly duplicates an effect already in the game via a skill: Blessing. Think about it: The rules say no two players may have the same skill, and no two players may have the same ability. This rule is there for a reason, but the Tactician breaks this rule - now, the party can have command 2, and actually my party had it from the get go! Sorry, but no party should start with +2 damage and +2 range. That is overpowered, period. 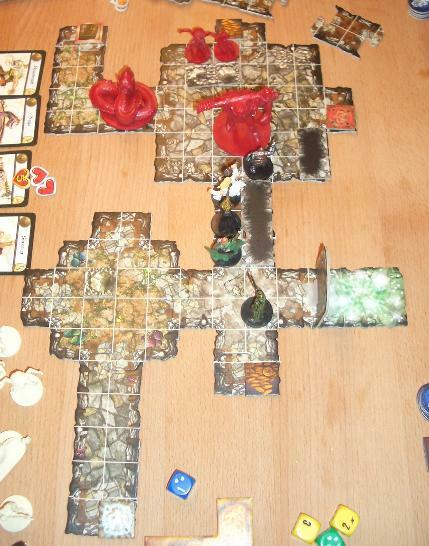 In Descent, damage is determined by rolling multiple dice. Because of this, damage is not distributed uniformly, but normally. For you non-statisticians out there, it means that you will roll medium damage a lot more often than minimum or maximum damage. It's like when taking the sum of two six-sided dice, as for example in Settlers of Catan, you will roll a 7 a lot more often than a 2 or a 12. What this means is that increasing the armor from let's say 2 to 3 is not as powerful as increasing it from 4 to 5, or even better from 5 to 6. The difference in average damage dealt to you will be the same, but what matters more in Descent is if the Overlord will be able to deal any damage at all. If he can, he can slowly wear you down and finish you off with a trap for example. But if it's almost impossible or not possible at all for him to damage a hero, he has lost the game. Take a look at the following graph. 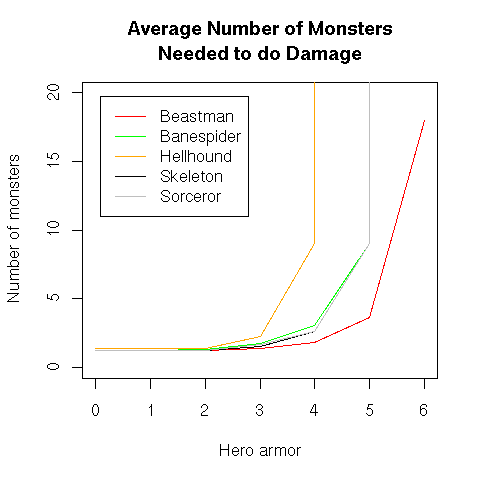 For the common monsters found in Descent dungeons, I have calculated how many monsters it takes on average to deal at least one point of damage to a hero, for different armor values. Yes I'm a nerd, although I prefer to say I'm just curious and like to think about what I do and find out how things work. Anyway, what you can see is that the increase in monsters it takes to be able to damage a hero is much higher for higher armor values than for lower ones. For example, with armor 3 it takes 1.38 beastmen on average to deal at least one point of damage to you. Increase your armor to 4, and now it takes 1.8 beastmen - a nice increase, but not overwhelming. However, increase your armor to 5, and now it needs 3.6 beastmen to be able to damage you - that's twice the amount than before. And increase it to 6 even, and suddenly you need 18(!) beastmen to be able to deal one measly wound to you, all because it's much less likely to roll max (or near-max) damage than to roll average damage! For other, weaker monsters it's similar, and what you can see is that the jump from armor 4 to 5 is the most rewarding one. Now all monsters except beastmen will either be unable to damage you at all (hellhounds), or will have extreme difficulties doing so - essentially rendering the Overlord's main source of CTs useless. Most monsters now need max damage to get through for at least one wound, which is highly unlikely for them to get thanks to the normal distribution of damage. And here the Defender ability comes into play. What it essentially does is increase the party armor by one against most attackers. Most heroes start with an armor rating of 2, which can be raised to 4 via items. The Defender ability now increases it to 5, thus providing the critical jump it needs to drastically weaken the monsters. The game still works with one high-armored tank in play (Nanok... ), but if most heroes are tough, it breaks. If you like to waltz through cardboard cutouts like hot steel through butter, then by all means do so and enjoy the game. I however don't, neither as a player nor as the Overlord. My definition of fun is to face a fair challenge, and I have no problems losing if I make mistakes or have some bad luck, or both. But losing because the deck is stacked against you is boring. It was an interesting experiment to use custom-made heroes for this campaign, but alas I think it has already failed. We will remove the Defender ability from Throgrim and replace it with something else (I'm sure it will be something that affects the whole party... ), but the damage has been done already, documented by the sounding lead in CTs by the heroes which might prove to be impossible to recover from. It's like playing chess against someone who starts with three queens instead of one, and after capturing your rooks with them you decide this breaks the game and he continues with only one queen - but your rooks are still gone. But since I like challenges, I'm looking forward to it nonetheless and see if I can climb out of this hole. However, I know I will never take part in any Descent game again that uses custom-made heroes, be it as a hero player or Overlord. It had been a mistake to judge the abilities only individually, and not assess their strength regarding the whole party. Especially with Road to Legend, you will have to live with such unbalances not only for a single session, but for many months, and that's just not worth it. Anyway, let's continue with the campaign! I don't like ending things prematurely, so we will play this out no matter what. I know there will be times the heroes will experience the same amount of bad luck I had during the last session, and the mistakes I made only taught me something which is always a Good Thing, so I know I will have fun nonetheless.